Many people today suffer from anxiety and panic attacks. 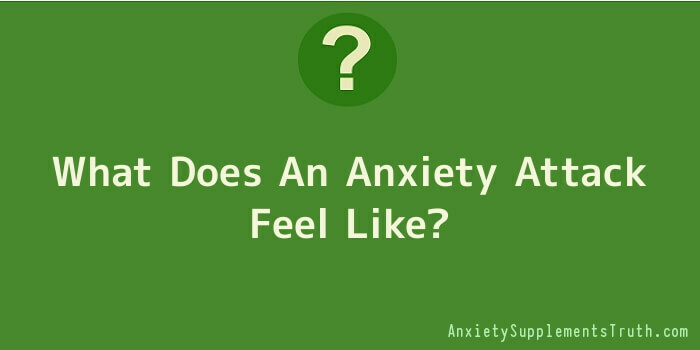 While one individual may be suffering from an anxiety attack and not be aware of it, another may believe they are suffering an anxiety attack and it may be something entirely different. Here a few symptoms so you’re aware of what an anxiety attack feels like. Patients that have experienced or experience anxiety attacks regularly usually state that unless you’ve actually experienced one, they are difficult to describe. Although they say anxiety attacks are the most frightening thing they’ve ever experienced, they still are difficult to describe to someone that’s never experienced them. One reason for the difficult is that they may vary from person to person. While one person may experience one set of symptoms, another person may feel an anxiety attack through entirely different symptoms, even though they’re both having an anxiety attack. Although, as I said, the symptoms may vary, four of the most common symptoms of an anxiety attack are tightness in the chest, shortness of breath and an increased heart rate and a sense or fear that something bad is about to happen. Although these symptoms may seem very frightening at the time you’re experiencing them, they won’t harm or hurt you and are usually brought on by the fear and anxiety. Once the patient realizes this, they’re better able to deal with the symptoms. One example is how adrenaline suddenly begins to flood the body, which is the reason for the increased heart rate and sweating. When the person is able to relax and breathe normally, the adrenaline flood stops and the symptoms dissipate. Unfortunately, many people think they are suffering from a heart attack or something equally serious when they begin experiencing anxiety attack symptoms. This fear is what causes them to be even more anxious, which makes the symptoms intensify. There is no reaction the human body can go through quicker than an anxiety attack. In addition to the most common symptoms, anxiety attacks may also affect how the eyes work, the glands, bladder, stomach and all the major muscles in our body. Because of the huge overload our cardiovascular system goes through, the heart beat is affected as well as our respiration. It is these symptoms of an anxiety attack that make the patient feel like they are dying or about to die. The symptoms of an anxiety attack that are experienced at the beginning of the attack can often determine how severe the attack is going to be. When they’re acknowledged for what they are, they can often be stopped before they cause more problems. Patients that have been experiencing anxiety attacks for many months or years are often able to recognize the symptoms and begin breathing exercises or certain types of learned therapy to put a stop to them or decrease their severity. What patients suffering from anxiety need to be aware of is that many symptoms of anxiety are also symptoms of other health issues. If you feel like you’re experiencing certain anxiety attack symptoms, it is recommended that you see a doctor to ensure that they are anxiety related and not indicative of a health problem so you can initiate the proper and most effective treatment.